Three months before they begin their World Cup defense in France, 28 members of the United States Women’s National Team have filed a gender discrimination lawsuit against U.S. Soccer, the sport’s governing body, for paying the men’s team more than the women’s team. This suit, first reported on by the New York Times’ Andrew Das, is the most significant escalation of a long-simmering disagreement between the team and the federation over how much the women’s team should be paid in comparison to their male counterparts. The USSF has engaged in systemic gender-based pay discrimination against its female WNT employees. The USSF has caused, contributed to, and perpetuated gender-based pay disparities through common policies, practices, and procedures. Since the USWNT won the 2015 World Cup, they have been demanding the equal pay they deserve. Three years ago, several prominent members of the team filed a federal discrimination complaint seeking equal pay, and two years ago, they collectively bargained for a new agreement that guaranteed them higher pay and better working conditions. Still, they didn’t lock down equal pay. Today’s lawsuit, filed on International Women’s Day, is an attempt to do so. The suit repeatedly points out how much more successful the USWNT has been than the USMNT, a discrepancy most neatly summed up in each squad’s most recent World Cup results (crushed Japan in the final; farted themselves to death against Trinidad & Tobago). According to the suit, U.S. Soccer posted a $17 million profit for the 2016 fiscal year thanks largely in part to the USWNT’s World Cup success and their comparatively low wages. 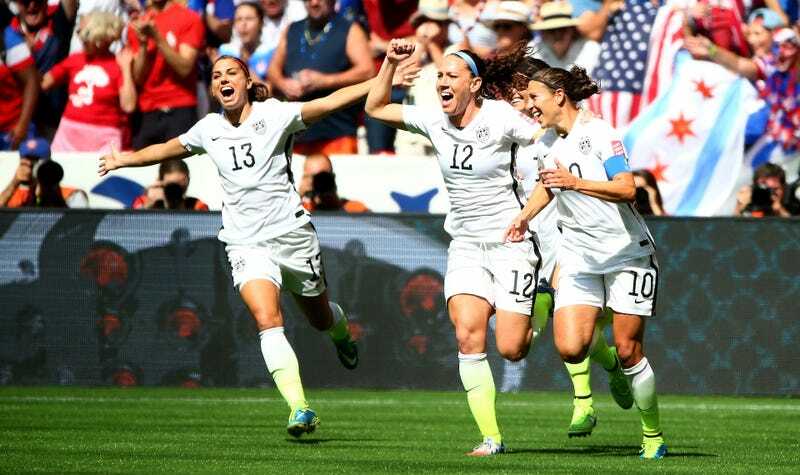 They say U.S. Soccer continued to lean on “market realities” as an excuse for the pay gap. The players have requested class action status, and if that’s granted, then any player who played for the team after Feb. 2015 would be allowed to join the suit and seek back pay. Currently, superstars like Alex Morgan, Carli Lloyd, and Megan Rapinoe are party to the suit, along with the rest of the current squad. As for the exact gap, their analysis showed women would 38 percent as much as men over a hypothetical 20-game period. The lawsuit also gets into other structural advantages afforded to the USMNT. The women’s team has to play more games on turf and fly commercial more often, all while being marketed less aggressively than the USMNT.